Addiction, hypertension, obesity, toothache, deafness & tinnitus, hysteria, fatigue or prostration, nocturnal enuresis, spermatorrhoea, impotency, buerger's disease, eczema, piles, urticaria, psoriasis. 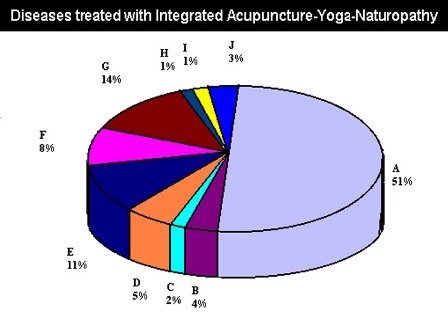 Apart from the Acupuncture Yoga-Naturopathy and Diet therapy, regular support of Physiotherapy, Allopathy and occasionally Homeopathy are also provided as and when necessary. Holistic approach towards diseases & treatment is found to be very effective, but it needs continuous development and team work. Health camps including exhibition and stall were arranged at different places of West Bengal and other states supported by local organisations. In all the camps a good number of patients were treated. Many people also enquired & got trained about the therapies & treatment appliances.